Recently, I had the privilege of fulfilling a once-in-a-lifetime (bucket list) event. 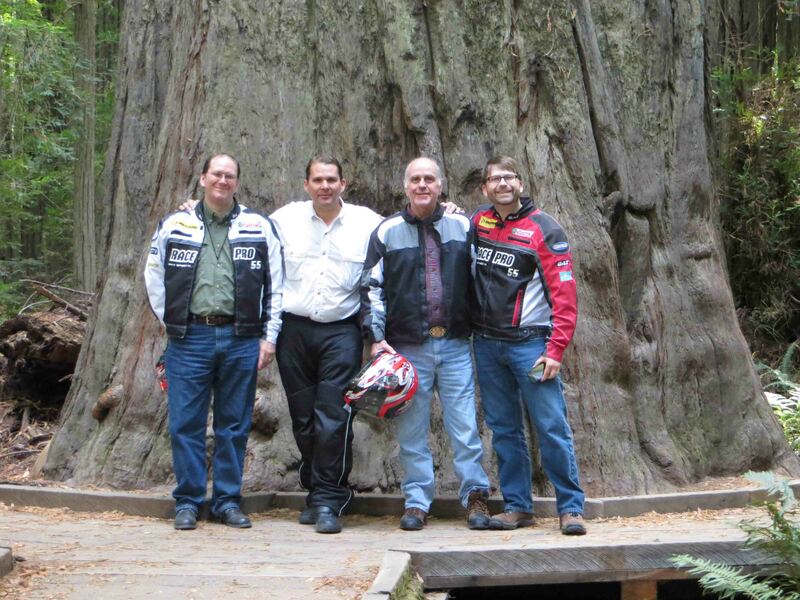 My wonderful father arranged for myself, my two brothers and himself to meet in San Francisco and rent motorcycles to take a trip up Highway 1 to see the redwood forest. It has been 20 years since we have ridden motorcycles, but it was an unique opportunity to enjoy part of this country that I have never experienced. Our trip took us through San Francisco, across the Golden Gate bridge, up Highway 1 through Ft. Bragg, California, up Highway 101 to Eureka and back through the Avenue of the Giants. We finished the trip traveling back down through Sonoma and Napa Valley. All of this over 5 days of beautiful country, hills, curves, bridges, farms, villages and the cities of northern California. An amazing trip to be sure. But of all the things I saw and experienced, one thing did stand out among the rest - the redwood trees. To be precise, the Coastal Redwoods. William has made several pens from redwood and even a few from the Gigantus Sequoia, but until you see these amazing trees in person, words cannot do them justice. There may be a number of ways to experience these magnificent sights, but we drove up Highway 101 to the Avenue of the Giants. The entrance is just north of Garberville, California and the drive takes you through a serene tour of these magnificent trees to Fortuna, California. These trees are the Coastal Redwoods (not the Giant Sequoias) so they are the smaller of the two, but they are massive (we did not get to see the Giant Sequoias, so I will have to return another day). Even the smaller of these redwoods is awe inspiring. The forests are intimidating with these trees. They appear almost as old souls, living as long as 2000 years. Redwood is a very light-weight wood, which probably helps the trees grow tall. The forest smells great and there are walking trails throughout the area. We stopped at the Founder's Grove and took a walk among the trees, simply awe inspiring. I would highly recommend that people visit this amazing part of our country. I plan to take William there someday. These trees are impressive and are worth our support through our National and State Park systems. Enjoy them. We did.